It’s June which means the grounds of Seattle are littered with dumpy, awkward kids. People often ask me why it is they’ve never seen a baby crow before and the answer is you probably have, you just didn’t know it. But once you know what to look for you’ll start seeming them allover the city. From the suburban backyard to the middle of Westlake center, kids are everywhere right now. Up close the signs to look for are: brownish feathers, blue eyes, short tails and pink/tan bills and legs. From far away the best tell is the behavior of the parents. If they’re wildly screaming, and dive bombing anything that moves, there’s probably a kid on the ground nearby. Notice the blue eyes, and tan bill and feet. While this fledgie is completely flighted its parents will still defend it if you get too close. 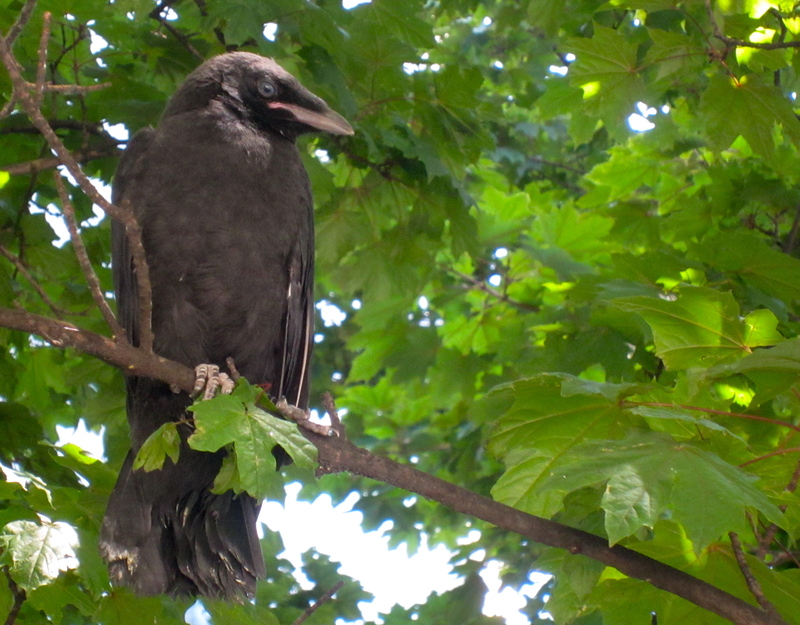 In contrast to many urban bird species, crows fledge the nest before they are completed flighted, spending about a week on the ground before they can fly comfortably. During this time the parents will continue to feed, and often aggressively protect their young. It’s a behavior that can be confusing both because people often don’t understand why their walk has turned into a scene from The Birds, and because it seems counterproductive to leave the nest before you can fly. But the stationary nature of nests make them easy targets for predators, and while the ground is not without its dangers, being mobile has proved a greater fitness advantage. Watching so many confused people defending themselves from angry crow parents while strolling through the park has made me wonder if it would be viable for the parks department to put out A-frame signs describing this behavior. Seems like an excellent opportunity to engage people with the natural world in which they live, and inform people that unflighted crows are not in need of their help, a common mistake that has separated many a baby crow from its parents and unnecessarily into the hands of wildlife rehabers. So keep your eyes and ears open and you’re bound to start seeing them everywhere!